NewU Financial operates in the financial services MLM niche and operates out of the US. The NewU Financial website identifies Jeff Long and George Wilson as co-founders of the company. Jeff Long first appeared on BehindMLM’s radar as the founder of AutoXTen, a recruitment scheme launched in 2011. AutoXTen collapsed a few months after launch, with Long going to launch SMS Dailies. It too didn’t last long. Long resurfaced in late 2015 with Get Paid Social, a Facebook spam pyramid scheme. Get Paid Social went into decline throughout 2016, prompting Long to launch 1 Online Business in mid 2017. 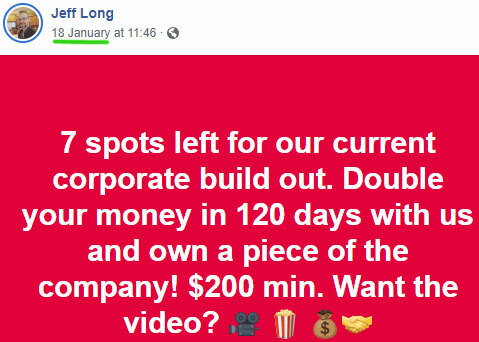 1 Online Business combined a cycler Ponzi business model with social media spam. Alexa traffic estimates for the 1 Online Business show a brief hype period followed by a collapse leading into 2018. Long launched and began promoting Luvv, a pyramid scheme, around April, 2018. Luvv is believed to have collapsed a few months after its launch. George Wilson appears to be a past participant of Long’s schemes, as evidenced by Wilson’s promotion of 1 Online Business in September 2017. Going back further, Wilson also promoted the Infinity2Global Ponzi scheme and Empower Network gifting scheme. Read on for a full review of the NewU Financial MLM opportunity. NewU Financial has no retailable products or services, with affiliates only able to market NewU Financial affiliate membership itself. NewU Financial’s compensation plan isn’t typical for an MLM company, but still operates within a downline/upline structure. Payments are made by downline affiliates, with referral commissions and a 200% ROI paid upline. The referral commission is single-level and not MLM. 200% ROI payments however can be collected further upline (over multiple levels). This requires the use of a unilevel compensation structure to track payments, so I’m classifying NewU Financial as an MLM company. That said NewU Financial’s business model isn’t typical of an MLM company, so this section of isn’t in our usual review format. 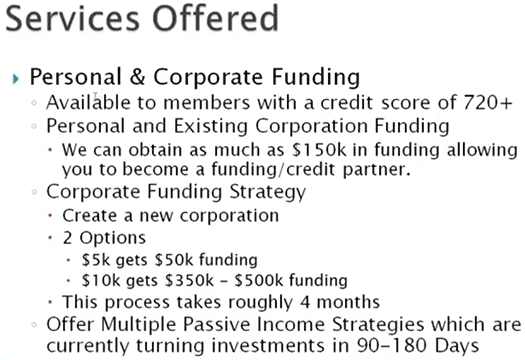 On the front-end of the plan NewU Financial is pitched to potential affiliates with a credit score of less than 720. 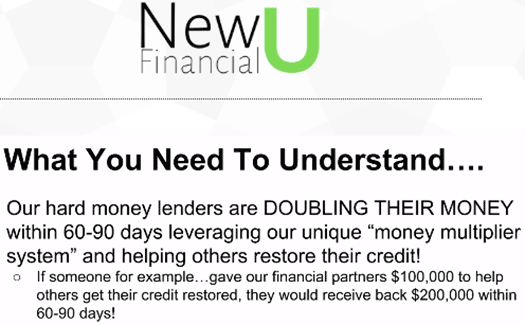 NewU Financial promises to restore credit scores of new affiliates to 720 or higher. This is achieved by existing NewU Financial affiliate(s) gifting “roughly $2500” to “fix” the credit score. The terms of this contract see the new affiliate agree to pay 200% of the amount it costs to fix their credit score, to the affiliate(s) who cover the cost of fixing their credit score. So where does someone with a crappy credit score get 200% of funds gifted to them to pay back? Upon the restoration of credit, the affiliate who’s credit was fixed is required to create a new corporation and take out a loan of up to $150,000. Upon getting a $150,000 loan, which is supposedly through NewU Financial’s “financial partner”, the first amount paid back is the 200% promised to the gifting affiliate(s). This is the basis of NewU Financial and Jeff Long advertising a guaranteed 200% ROI in 120 days. What’s left of the loan is expected to be rolled back into NewU Financial, as gifting payments to new affiliates wanting to fix their credit score. The loaned money is gifted to these affiliates on the promise of a 200% ROI. That’s essentially the flow of money within NewU Financial. On top of this is what NewU Financial calls “corporate funding”. $20,000 is paid by NewU Financial to set up a corporation, through which a loan of $350,000 to $500,000 is obtained. 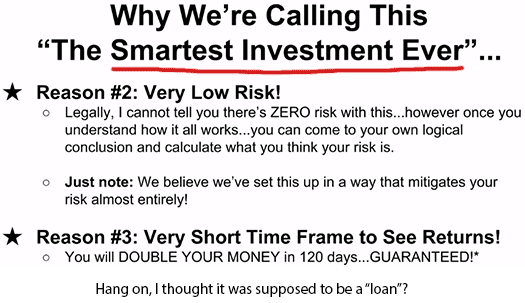 Some marketing material I cited also quoted $5000 to get a $50,000 loan and $10,000 for a $350,000 to $500,000 loan. 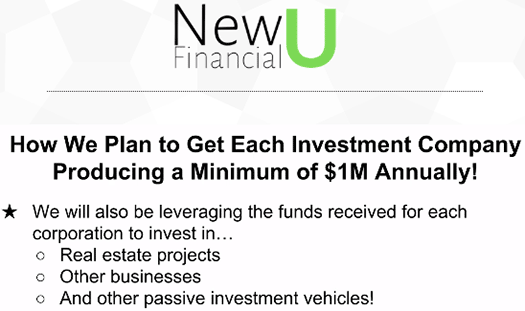 Affiliates can buy into the $20,000 corporations that NewU Financial sets up, via $100 investment positions. 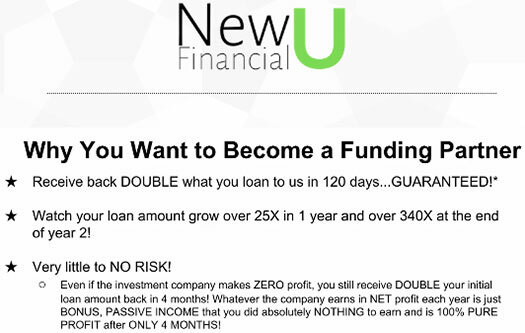 Each $100 investment by NewU Financial is made on the promise of a guaranteed 200% ROI in 120 days. As above, NewU Financial are effectively marketing $100 positions in the corporations they set up as shares. For each $100 a personally recruited NewU Financial affiliate invests, the affiliate who recruited them receives a $30 referral commission. The 200% ROI is paid out of the $350,000 to $500,000 corporate loan obtained through the newly set up company. 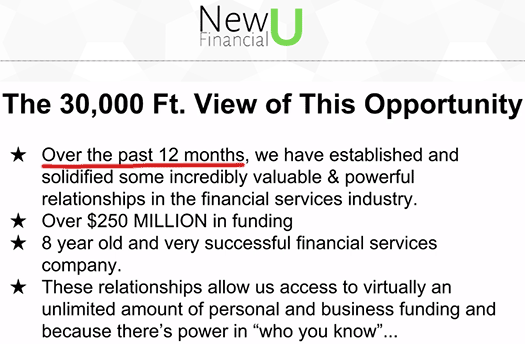 $150,000 is paid to NewU Financial’s “financial partners” as an additional “consulting fee”. With what’s left NewU Financial pays a 0.2% dividend per share on annual profit generated by the company. NewU Financial claim each corporation they set up will “produce a minimum of $1 million annually”, by reinvesting the corporate loan (sans 200% ROI payouts) back into their credit restore scheme. Basically as opposed to an affiliate getting a loan and individually gifting funds, NewU Financial are doing it on a larger communal scale through corporations they set up. Before we go any further, let me reiterate where we’re at with NewU Financial’s corporate funding scheme. NewU Financial affiliates invest in $100 shares offered out of a $20,000 sum. Once $20,000 is reached, NewU Financial take the money and through undisclosed “financial partners”, set up a shell corporation. Once set up, the shell corporation applies for a corporate loan of up to $500,000. Affiliates who invested in $100 shares are paid a 200% ROI on funds invested, from the acquired corporate loan. $150,000 is paid to persons unknown, with the total loaned amount supposedly paid back through the credit restoration scheme, “real estate projects”, “other businesses” and “other passive investment vehicles”. In addition to paying the corporate loan off, NewU Financial reckons they’ll be able to make over $1 million per set up corporation annually. If none of that set off your alarm bells, brace yourself because we’re yet to go over NewU Financial’s “corporate stacking system”. Yes, it’s as bad as it sounds. To use NewU Financial’s own example, $20,000 of the corporate loan funds obtained by “Corporation A”, will be used to set up “Corporation B”. Corporation B will also make upwards of $1 million a year via something something. Virtual $100+ shareholders in Corporation will receive the same pro rata share of profits they get from Corporation B as they do from Corporation A. The example provided in NewU Financial’s marketing material extends three corporations deep. The total number of times NewU Financial plans on doing this with one corporation however is unclear (one example states seven times within a two-year period). NewU Financial affiliate membership is free. Free affiliates however can only earn 30% referral commissions on $100 investments made by recruited affiliates. 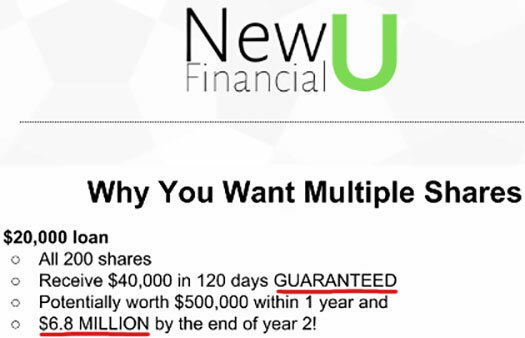 Full participation in NewU Financial’s MLM opportunity requires a minimum $100 investment. Even if the MLM nature of NewU Financial’s business model is debatable, the underlying business model raises some serious regulatory red flags. First let’s go over the credit restoration side of the business. Let’s create Bob, a hypothetical person with a credit score of less than 720. Bob signs up and accepts credit restoration from an existing NewU Financial affiliate (or perhaps even the company itself), on the promise of paying back 200% of whatever it costs to restore Bob’s credit score. Funds are gifted on Bob’s behalf and over 120 days Bob’s credit score is repaired to 720 or more. Bob is happy with his repaired credit score and does a runner. No setting up of a shell corporation, no loan and so no 200% ROI. 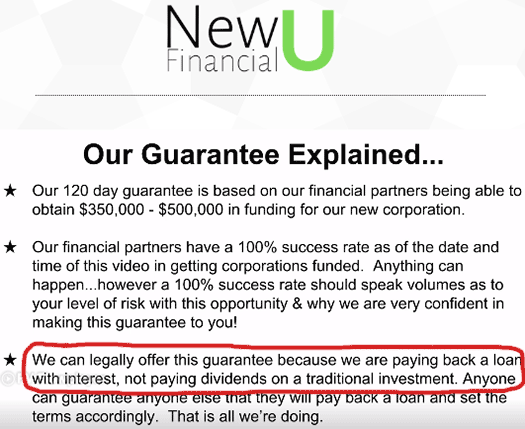 On the regulatory side of things, NewU Financial is signing up affiliates on the promise of a guaranteed 200% ROI. That’s a security and in order to be legal in the US, requires NewU Financial to be registered with the SEC. As I write this however, neither NewU Financial, Jeff Long or George Wilson are registered to offer securities in the US. NewU Financial’s business model being a securities offering is important because it means the company is legally required to provide disclosures to certain investors. Off the top of my head the two obvious ones are who NewU Financial’s partners are, exactly what they’re doing with invested funds and their track record. By all means this can be kept a secret if a company was working for itself, but when you’re soliciting investment from the public this information needs to be made available both to the SEC and the general public. not enough people sign up for the credit restoration service. Some of those concern the affiliate getting their credit restored, the affiliate investing $x on the promise of a guaranteed 200% ROI or NewU Financial as a company itself. Regardless and considering the amounts of money involved, there’s some pretty big risks being taken here (mostly by the unnamed lender, who themselves are bound to financial laws regarding lending). Moving onto the “corporate stacking”, believe it or not loan stacking as it’s known is not illegal in and of itself. Misstating the purpose of a loan and/or obtaining one via deception can lead to all sorts of financial problems, most of which are far greater than simply having a bad credit score. With respect to creating a corporation, obtaining a corporate loan, using some of that money to create another corporation, acquiring another corporate loan, using some of that money to create a new corporation etc. etc., what happens if these companies fail to pay back their acquired loans? I’m pretty sure if I approached a lender about acquiring $350,000 to $500,000 so I can set up new corporations to loan even more money, with the promise I’ll pay everything back through a credit restoration unregistered securities offering, I’d be laughed out of their office. Yet here we have Jeff Long and George Wilson supposedly doing just that. Securities law violations exist in NewU Financial’s corporate stacking model, by way of $100 virtual shares being offered on the promise of a 200% ROI and ongoing dividend payment. Like the “investments are loans” pseudo-compliance, NewU Financial refers to annual dividends as “a gift”. Setting up shell companies stacked on top of each other and paying returns and dividends on invested funds isn’t just something you can set up and, when the SEC come knocking, explain it away by claiming invested funds in shares are “loans” and paid out dividends are “gifts”. I mean you could, but do you really think the SEC are going to buy it? And look, here’s what I really don’t understand. As above, NewU Financial is advertising a passive second year $6.8 million return off an initial $20,000 investment. If the $6.8 million return was possible in two years through entirely legal means, why haven’t Jeff Long and George Wilson obtained $20,000 and set up a bunch of shell corporations by themselves? Advertise the credit restoration business as a stand-alone (which would allow you to keep the methodology secret), and in turn keep 100% of the generated profit. Why share infinity money derived from an endless chain of corporations with randoms over the internet? Pretty much every aspect of NewU Financial’s business model is a house of cards, resting on a constant stream of people wanting to fix their credit, create a corporation, obtain a loan and then themselves participate in securities fraud to pay it back. If that’s as flimsy as it sounds, it’s because it is. This is basically a matrix scheme confabulated with a bunch of buzzwords. Any business lawyer would laughed them out of the office. I’m guessing this business idea is scribbled on the back of a beer coaster after getting drunk. 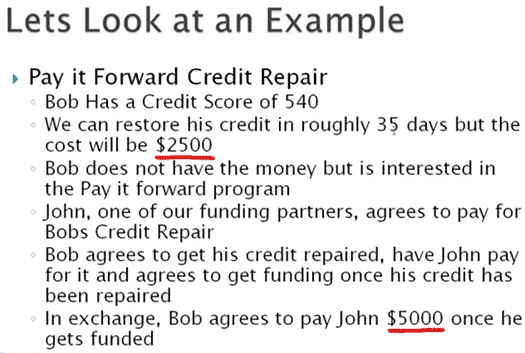 The fact that “Bob” promise to pay 100% interest for the supposedly loan (for his credit repair) would mean this is usury, which is illegal in itself. And that’s just the most OBVIOUS problem. There are plenty more to laugh at. Also, merely borrowing money and returning it via private party is not going to restore one’s credit. It’s stuff that gets reported to the credit bureaus that improves one’s credit score. Not to mention “give us 5K, and we’ll lend you 50K to lend to others” What the **** does that even mean? Most likely explanation is it’s monopoly money… There is no 50K except in the bogus ledgers somewhere… Much like Zeek’s “VIP Points”. 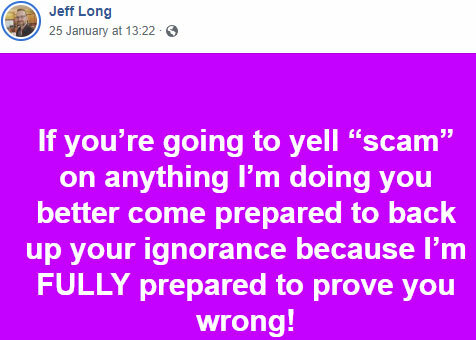 Once a scammer, always a scammer, beware of Jeff Long! Clarification, HALF of the US states have anti-usury laws. And different states have different definitions on what applies and what doesn’t. If this guy plans an all US launch, he’ll have a great time explaining to different state lawyers on what’s legal and what’s not. For example, California limits maximum interest to 10% if the loan is for personal, family, or household purposes. As this is personal credit repair, it should apply. Depending on how long the time limit is to pay it back in this scheme, the interest rate calculated could be 200% or higher APR (100% if 12 months to pay back, higher if less time). (Revolving credit is not considered a loan, if you are asking). According to his Facebook profile, Jeff Long “lives in Spanish Fork, Utah”. are you saying it’s a big Spanish Fork, U? Soooo…. Lemme see if I got this right.. I watched their video LOL. NewU is crowd funding to set up shellgame corporations to get financing.. so they are taking debt from the public, to fund shell corporations to get more debt from lenders, then repay the people using that debt, and if they can’t get the funding they still promise to pay all their debts using money they don’t have… ?? Yeah pretty much. Ever-increasing shell company debt until ruhroh raggy!